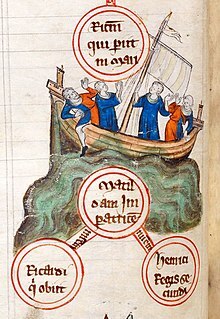 Between the ninth and thirteenth centuries England went through the Medieval Warm Period, a prolonged period of warmer temperatures that allowed poorer land to be brought into cultivation. Agricultural land became typically organised around manors. By the eleventh century, a market economy was flourishing across much of England, while the eastern and southern towns were heavily involved in international trade. Many hundreds of new towns, some of them planned communities, were built, supporting the creation of guilds and charter fairs. 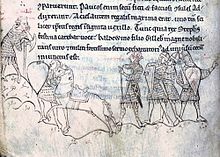 Anglo-Norman warfare was characterised by attritional military campaigns of raids and seizure of castles. Naval forces enabled the transportation of troops and supplies, raids into hostile territory and attacks on enemy fleets. After the conquest the Normans built timber motte and bailey and ringwork castles in large numbers, which were replaced by stone buildings from the twelfth century. The period has been used in a wide range of popular culture, including William Shakespeare's plays. Walter Scott's location of Robin Hood in the reign of Richard I and his emphasis on the conflict between Saxons and Normans set the template for later fiction and film adaptations. 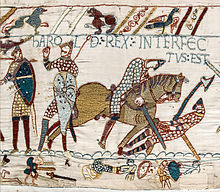 After re-establishing his authority in England, John planned to retake Normandy and Anjou. The strategy was to draw the French from Paris while another army, under Otto IV, Holy Roman Emperor, attacked from the north. However, his allies were defeated at the Battle of Bouvines in one of the most decisive and symbolic battles in French history. The battle had both important and high-profile consequences. 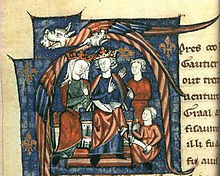 John's nephew Otto retreated and was soon overthrown while King John agreed to a five-year truce. 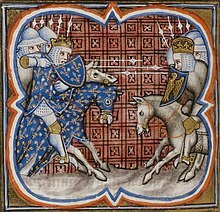 Philip's decisive victory was crucial in ordering politics in both England and France. The battle was instrumental in forming the absolute monarchy in France. Medieval England was a patriarchal society and the lives of women were heavily influenced by contemporary beliefs about gender and authority. However, the position of women varied according to factors including their social class; whether they were unmarried, married, widowed or remarried; and in which part of the country they lived. Significant gender inequities persisted throughout the period, as women typically had more limited life-choices, access to employment and trade, and legal rights than men. 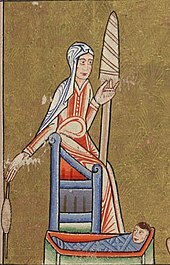 After the Norman Conquest, the position of women in society changed. The rights and roles of women became more sharply defined, in part as a result of the development of the feudal system and the expansion of the English legal system; some women benefited from this, while others lost out. The rights of widows were formally laid down in law by the end of the twelfth century, clarifying the right of free women to own property, but this did not necessarily prevent women from being forcibly remarried against their wishes. The growth of governmental institutions under a succession of bishops reduced the role of queens and their households in formal government. Married or widowed noblewomen remained significant cultural and religious patrons and played an important part in political and military events, even if chroniclers were uncertain if this was appropriate behaviour. As in earlier centuries, most women worked in agriculture, but here roles became more clearly gendered, with ploughing and managing the fields defined as men's work, for example, and dairy production becoming dominated by women. Pilgrimages were a popular religious practice throughout the Middle Ages in England, with the tradition dating back to the Roman period. Typically pilgrims would travel short distances to a shrine or a particular church, either to do penance for a perceived sin, or to seek relief from an illness or other condition. Some pilgrims travelled further, either to more distant sites within Britain or, in a few cases, onto the continent. Under the Normans, religious institutions with important shrines, such as Glastonbury, Canterbury and Winchester, promoted themselves as pilgrimage destinations, maximising the value of the historic miracles associated with the sites. 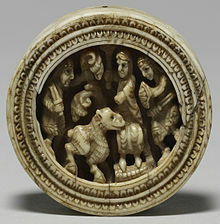 Accumulating relics became an important task for ambitious institutions, as these were believed to hold curative powers and lent status to the site. 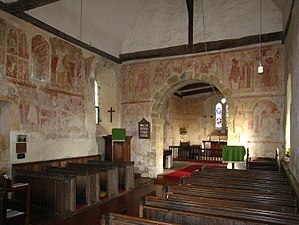 By the twelfth century reports of posthumous miracles by local saints were becoming increasingly common in England, adding to the attractiveness of pilgrimages to prominent relics. 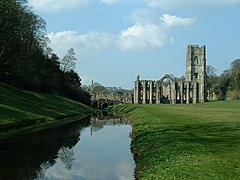 England had a diverse geography in the medieval period, from the Fenlands of East Anglia or the heavily wooded Weald, through to the upland moors of Yorkshire. Despite this, medieval England broadly formed two zones, roughly divided by the rivers Exe and Tes: the south and east of England had lighter, richer soils, able to support both arable and pastoral agriculture, while the poorer soils and colder climate [sic] of the north and west produced a predominantly pastoral economy. Slightly more land was covered by trees than in the twentieth century, and bears, beavers and wolves lived wild in England, bears being hunted to extinction by the eleventh century and beavers by the twelfth. ^ Jones 2012, p. 217. ^ Jones 2012, pp. 221–222. ^ Burton 1994, pp. 23–24. Bull, Marcus (2007). "Criticism of Henry II's Expedition to Ireland in William of Canterbury's Miracles of St Thomas Becket". Journal of Medieval History. 33: 107–129. doi:10.1016/j.jmedhist.2007.04.001. ISBN 0199251010. Archived from the original on 14 October 2008.